If I can ask Snow White’s evil stepmother’s magic mirror who the oiliest of them all is, I am certain that he will reply that it is me. I know I am being exaggerated but I do have a really oily skin. Living in a hot and humid country makes it all worse. I have tried a few skincare products to find the solution for this problem but to no avail. 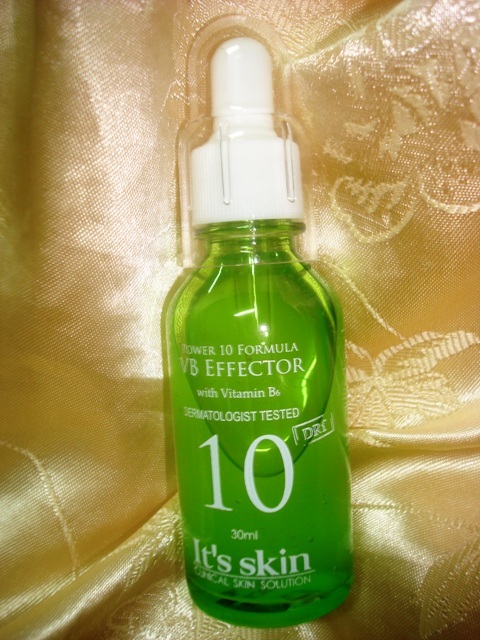 When I read about rave reviews of It’s Skin Power 10 Formula VB Effector in blogs, I know I have to get hold of it, too. First Impressions: It comes in a cute plastic container that doesn’t take up much space on my dressing table. It also comes with a dropper so more brownie points for being hygienic. The white dropper also comes with a cap to avoid getting dirty or dusty. Oh, ingredients and directions for use are all in Korean so it should be hard to those who can’t read Hangul (but Google can do the trick :)). Colour and Consistency: It’s also colourless and oil-free so it’s not thick like your typical essences/ serums. It’s watery and light. Since its consistency is light, after application, it is quickly absorbed by the skin in probably three seconds. The VB Effector on the skin feels cool (not alcohol-cool) that you can feel the skin “breathe”. Directions for use: I use this product after applying toner. (For me, just 3-4 drops of essence are enough for my entire face. ) I gently massage it on my face and pat my face after so the skin can absorb it more. I let it set for a few minutes before I apply emulsion/ moisturiser. Results: I have been using it for more than a week now and I can attest that this product works. I usually get oily after 2 hours of make up application and this little wonder has helped me become less of a greaseball. I can stay oil-free after 4-5 hours! How awesome can it be! When I feel that my face gets shiny, I just use oil blotting sheets and voila, there’s not much need to reapply more makeup (I use powder sometimes, though). I also noticed that my pores have gone smaller and my skin got brighter (although, I’m not 100% certain that this is because of the VB Effector as I am using other skincare products that claim to do these wonders). Availability: I got my VB Effector from Gmarket. I’ve seen a Thai website for It’s Skin but I haven’t visited the physical store. Will I buy again? : Yes, I will and I recommend it. I’m really happy I found and bought this. It really works wonder on my terribly oily face. I should have gotten more bottles when I made my last Gmarket order. *It’s Skin is a South Korean brand and the Power 10 line has many variants to suit many different skin needs such as whitening, hydrating, moisturising, and more. What oil control products do you use and work well? Care to share? Thanks for reviewing this! 😀 It seems like a good product, but I have a question… do you HAVE to use moisturizer after using this or is it moisturizing enough to use without it? I do use a moisturizer afterwards. Since it’s consistency is watery, it is absorbed quickly by the skin and dries fast (not in a bad sense of dry) so you need a moisturizer to hydrate your skin more. I haven’t really tried it by itself, but I will test it.